Florida citrus trees may require irrigation throughout the year due to the extremely sandy soils with low water-holding capacities, and the warm subtropical climate with distinct drought periods in spring. A soil water sensor system can provide the most reliable data for effective citrus irrigation scheduling in these conditions. The July 2017 Citrus Industry article “Understanding soil moisture sensor data” provided a detailed explanation for interpreting the soil water content graphs produced by soil water sensors. This article will discuss the merits of different types of sensors available, which ones are best suited for Florida citrus and their proper installation. The main benefit of using soil water sensors to schedule irrigation is that they improve water use efficiency and hence reduce water consumption, while contributing to deeper plant root growth and avoiding excess irrigation and nutrient leaching. By preventing over-watering, they also eliminate conditions that are favorable to some pests and fungal diseases. These statements are particularly true for trees that are impacted by citrus greening disease, since reduced root size and function can exacerbate drought effects, while over-watering can increase root diseases and nutrient leaching. There are at least seven different operating principles used by various brands of electronic soil water sensors: time domain reflectometry (TDR), time domain transmission (TDT), frequency domain reflectometry, amplitude domain reflectometry, phase transmission, tensiometer and resistance granular matrix sensors. Tensiometers and granular matrix sensors measure the water potential of the soil directly. The water potential represents the energy required for plants to take up soil water, and thus tensiometer sensors mimic the process plant roots use to absorb soil moisture. The units of water potential are therefore a negative pressure, expressed in units like kilopascals or pounds per square inch. Most other sensors fall in the “volumetric water” measuring category because they are calibrated to express the soil water as volume of liquid water per unit volume of soil. Discussing the advantages and disadvantages of every sensor in detail would be beyond the scope of this article, but Table 1 summarizes the main features of some commonly used sensors. It also includes important criteria to be aware of when using water sensors in sandy soils. Table 1. Main features, advantages and disadvantages of selected soil water sensors for use in Florida citrus groves. Desirable features are shown in green, with orange and red colors ranked less satisfactory. Figure 1. 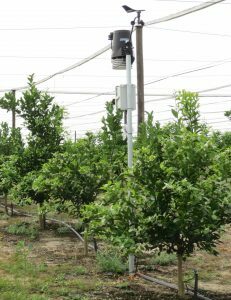 A grower’s commercial citrus under protective screen grove includes a wireless weather station with TDT soil sensors in 1-year-old trees. Based on our experiences and the comparisons given in Table 1, we prefer to use compact TDT and TDR soil water sensor devices for our research in Florida citrus soils. These sensors have built-in temperature and salinity compensation and require no calibration, making them accurate, reliable and easy to use. These sensors are affordable, particularly when procured in bulk. We also installed weather stations with TDT soil water sensors in commercial groves (Figure 1) to gather additional information and feedback from citrus growers under typical production conditions. Before installing a soil water sensor, select a suitable “sensor tree” in the grove that represents the average condition of the trees in the irrigation zone. Avoid very large or very small trees, and those that have major defects or disease symptoms. Consider the distance from the sensor to the nearest power source (e.g., pumphouse) or data logger location if the sensor system will require them. If wireless data communications will be used, consider the proximity to the nearest receiver station and the ability to mount an external antenna mast. If the soil sensor station will be solar-powered, then ensure that the solar panel faces south, away from the sensor tree, without excessive shading from surrounding trees. For citrus groves, two sensors installed at two depths in the irrigated soil under a tree canopy are adequate per location. The upper-level sensor can be installed in a vertical orientation by simply pushing the metal prong or loop body into soft sandy soil, until the plastic cable header is about level with the surface of the soil or leaf litter. Soil water will be measured along the metal body only, representing a depth interval of approximately 2 to 8 inches below the soil surface. The second sensor is installed horizontally at a depth of 18 inches, approximately below the upper sensor. The upper sensor will therefore measure the soil water in the critically important topsoil layer with the highest density of citrus roots. The lower sensor serves to check whether the upper layers are adequately filled with water, and also warns the user when excess irrigation or rainfall has occurred. 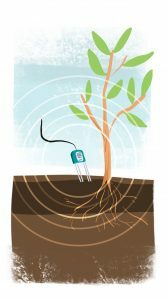 Avoid large roots and other buried objects like pipes that could cause air gaps and interference around the sensor body. Avoid placing the sensors in any location where water from irrigation or rainfall will be concentrated or shielded (e.g., avoid the tree dripline and the base of the trunk, or low spots). Avoid placing sensors too close to or too far from the irrigation emitters. About midway in the wetted pattern is a good position. Try to replace and compact the soil back to where it came from during sensor installation because topsoil and subsoil have different water-holding capacities. Ed Pines, EIP Citrus: “The soil moisture sensors help us manage our water needs based on actual, real-time data. Having the information on a web-based system allows us to monitor the information, through the ‘weather app,’ giving us very user-friendly and precise information on the soil-moisture conditions, anytime and from anywhere. It’s an extremely beneficial and very cost-effective way to manage our water needs and irrigation cycles. Jerry Mixon, KLM Farms: “It definitely has been a learning year. Probably the one thing I can say for certain is I will not grow future citrus acres without this tool. The ability to manage the off/on of the (irrigation) system by zone due to information/data received from the soil moisture sensor leaves me as the owner feeling very much in control of the irrigation/water applied to the individual zones. This in turn gives me confidence that we are doing everything we can to best use our allocated resources. I anticipate, based on the past 16 months’ experiences, that in this age of greening and stressed root systems, it will give me the best opportunity to succeed. At some point, we will incorporate salinity sensors to act as a verification that the desired injected fertilizer is getting to the tree as intended. Soil water sensors can instantly provide real-time data about soil water: where the water is located in the soil, in what quantities, how fast the water content is changing and whether it is increasing or decreasing (Figure 3). 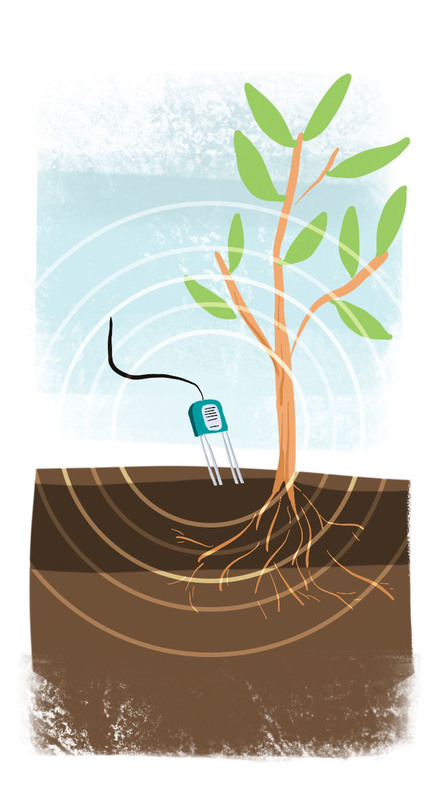 Soil sensors provide valuable feedback of soil water conditions before, during and after irrigation or rain events and therefore help diagnose irrigation systems. Figure 3. 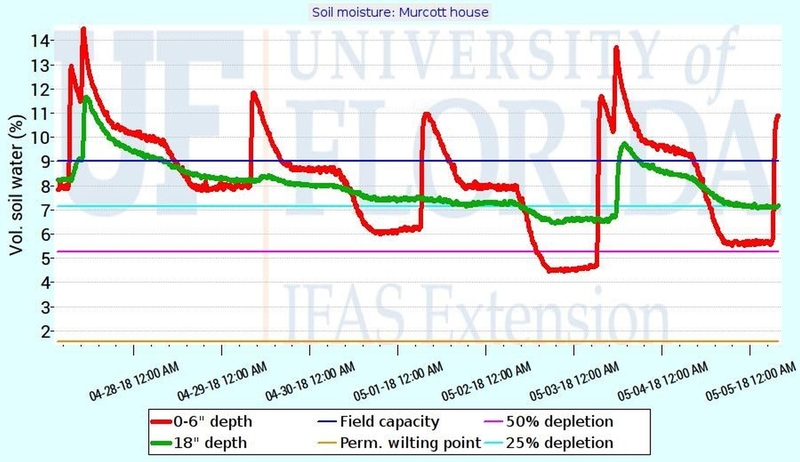 A typical soil water sensor time series, measured at two depths in the soil profile of a citrus grove, shows water depletion and replenishment cycles. Many timer-based automatic irrigation systems, with or without remote monitoring, provide limited reporting feedback, often simply indicating that “the system has run for a preset time at a preset date/time.” Having sensors in place under the trees provides the best verification that the irrigation water or rain actually reached the trees’ roots as intended. Arnold Schumann (schumaw@ufl.edu), Laura Waldo (waldo@ufl.edu) and Davie Kadyampakeni (dkadyampakeni@ufl.edu) are at the Citrus Research and Education Center in Lake Alfred, Rhuanito Ferrarezi (rferrarezi@ufl.edu) is at the Indian River Research and Education Center in Fort Pierce, and Chris Oswalt (wcoswalt@ufl.edu) is at the Polk and Hillsborough County Extension office in Bartow — all with the University of Florida Institute of Food and Agricultural Sciences.